As trends shift and tenant desires change, design and aesthetic preferences having gained importance in recent years and influenced many ‘must-haves’. 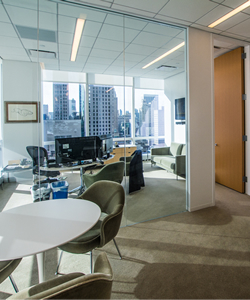 Manhattan’s real estate market has many spaces to fulfill any office requirements. High quality finishes can radiate professionalism with engaging receptionist areas and trendy offices. If you have a new company searching for a space with high quality finishes, you must look in Manhattan’s Class-A buildings. Finding an office for your company starts with examining your budget. It may seem the decision is between a refined office or a receptionist, conference room, and the works. The choice seems clear when stated that way. What if you can have your cake and eat it too? The newer office trends are focusing on higher-end quality finishes well above the standard finishes present in build-out offices. Businesses are opting for more creative and innovative office build-outs. Forgoing the traditional office layouts and design. These new spaces are on a spectrum from more effective to fun spaces. The newer office designs are created to foster a collaborative and highly productive environment. The goal is to allow employees to work in various spaces and not attached to their individual desks. The design is focusing on a home away from home environment. Comfortable furniture in being placed in meeting areas and other relaxed spaces. Employees are offered various places to work throughout the office from meeting areas to small corners boosting a social and flexible teamwork atmosphere. The demand for open layouts accent the modern design with open loft ceilings and exposed ductwork highlighting the raw industrial feel. To compliment the more modern design, designers are choosing standing furniture and other unique furniture options. Active and flexible workplaces are a goal of the modern workplace. Designers are achieving an active workplace environment with open layouts and décor. Office design is shifting from traditional wallpaper and furnishings. New materials are focusing on health, low-VOC, and energy efficiency. Glass finishes are included in the interior and exterior design. 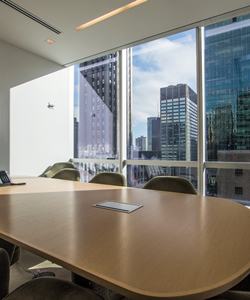 Glass finishes allow natural light to brighten the office space and highlight open layouts. Energy efficient and LED lighting are becoming the standard lighting in office space, no longer the exception. Fluorescent light bulbs are quickly becoming outdated and replaced. High quality lighting improves the office atmosphere and cuts energy costs. Office design in recent years became more geared towards energy efficiency, green materials, and sustainable solutions. “Going green” has become more cost-effective in the recent times, prompting businesses to embrace green design. Office tenants are focused on improving wellness, productivity, health, and efficiency of the staff. The cost in the Manhattan real estate for renovations are mostly on a spectrum. A “vanilla” finish in a non-union building cost about $40-$60 PSF and in a union building cost $75-$100 PSF. As you design and choose finishes, the price will become more pricy. As you, review the budget for your renovations cost, remember the cost will vary from season to season and based on shipping and fuel cost. Renovating in a suburban and urban market may lower or raise the price. Contact our brokers to discuss and assist in the negotiating the contract to any renovations at no obligation or fee.